Most of us go through a lot to get perfect hair - from expensive dyes and products to hours spent styling in front of the mirror. Yet, these animals with amazing hair don't have to put in a single stitch of effort. There's no straightening needed to get those glorious Cher-like locks and no curling for perfect beachy-waves. There's no need to lather scalps in frizz-fighting products, and no burning with bleach and dye. These animals truly have some great hair, and it's a gift from the heavens above. In most cases, these animals literally woke up like this. Crazy animal hair comes naturally for these beautiful creatures - from the Selkirk Rex's adorable ringlets to the endangered Mary River Turtle who fashions a pretty punk rock wig. No matter what the texture, length, or style, these hairy animals really know how to rock the perfect do. So, go ahead and express yourselves - you are all wonderful. These sheep are far superior to your average sheep. Yeah, we all love sheep's coats because they make awesome sweaters, but a sweater from one of these guys would be a literal dream. Valais blacknose sheep standout because their wavy, fluffy fur is stark white against their adorable, little black faces. An Angora Rabbit Or Oversized Cotton Ball? It's hard to tell whether this little guy is a real, living rabbit or actually an oversized puff ball bought at your local CVS. Angora rabbits are actually bred for their long, soft fur, and they're one of the oldest types of domesticated rabbits around. We're guessing this little bunny definitely eats his veggies for a shiny, healthy coat. There's no way you've seen a cow with hair this majestic - it is a sight upon sights. Seriously, what kind of product does he use? While most of us are used to seeing a mere normal cow, in all of its scruffy, unkempt glamor just hanging out in a field, this little guy is a genuine show cow. And he even makes money off his good looks! These horses were bred to pull caravans - only instead of looking like a totally sweaty mess after a long, hard workday, these horses maintain their gorgeous locks effortlessly. 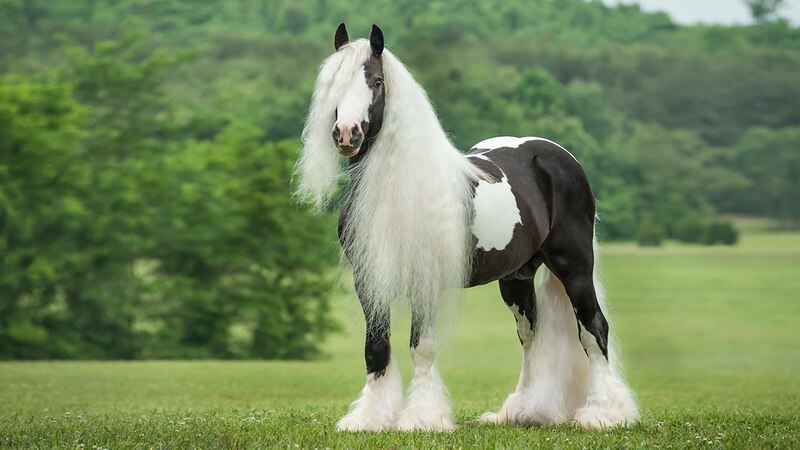 Dubbed the Gypsy Vanner Horse sometime after World War II, these ponies are known to be friendly and easily trainable. Their trademark majestic hair is just an added bonus - beauty inside and out!